ASEAN needs to find new areas and fresh commitment to work together so that the grouping can remain central to the region's architecture and future. Prime Minister Lee Hsien Loong said this yesterday, as he made the point that the grouping can only maintain its centrality "if it is a substantial endeavour, if its members see value in the shared enterprise". Spelling out the challenges facing the grouping, including worrying trade tensions between the United States and China, PM Lee set out why ASEAN has to speak in a collective voice to be effective as it reacts to these major external trends. If each member state were to fend for itself and go its own separate way, the grouping would be less relevant to its own members and to other powers, he said at the opening ceremony of the 32nd ASEAN Summit, which Singapore is hosting as this year's chairman. "Individually, the ASEAN member states will find it hard to make much impact on their own. But when we speak in one collective ASEAN voice, we can be effective," said PM Lee. This is why it is important for ASEAN to redouble its integration and community-building efforts. At the summit, ASEAN leaders also discussed regional developments. On the disputed waters of the South China Sea, PM Lee called the situation "relatively calmer". But negotiations between ASEAN and China on a code of conduct in the South China Sea, which began last month, will "take some time". He outlined the various difficulties involved, such as whether the code of conduct would be legally binding, how to define exactly what ASEAN and China were disagreeing about, and should the code be binding or legally binding - how these issues will be arbitrated, where and by which authority. "These are all very difficult issues. They will take a long time to crystallise, never mind agree upon," he said. "But it's better that we spend our time talking about the code of conduct constructively... than not to try and to just take unilateral measures that just lead to escalation and unpredictable consequences." During the summit, Myanmar briefed its fellow ASEAN members on the situation in its Rakhine state, from where more than 700,000 Rohingya Muslims fled amid a military crackdown. At a press conference afterwards, PM Lee said that ASEAN encourages Myanmar and Bangladesh to continue to carry out the voluntary return of displaced persons in a "safe, secure and dignified way without undue delay". Prime Minister Lee Hsien Loong yesterday said ASEAN will continue to support efforts to secure the denuclearisation of the Korean peninsula in a peaceful manner, and that the grouping welcomed the historic summit between leaders of North and South Korea. Denuclearisation of the Korean peninsula was one of several regional developments which leaders discussed at the 32nd ASEAN Summit hosted by Singapore, which is chairing ASEAN this year. At the summit and related meetings over the past two days, the leaders adopted concrete proposals on how ASEAN can be resilient against threats like cyber attacks, and be innovative in its use of technology to grow its economies. The leaders signed off on a statement to boost cyber security across the region, and agreed on Singapore's proposal to set up a network of 26 smart cities across ASEAN. They also discussed the Code of Conduct for the South China Sea, among other issues. In his remarks at the opening ceremony of the summit, Mr Lee had highlighted the need for ASEAN to speak in a collective voice to be effective as it reacts to major external trends, such as growing protectionism and trade tensions between the United States and China. ASEAN leaders voiced their deep concern over the rising tide of protectionism and anti-globalisation sentiment in a chairman's statement released yesterday, and reiterated their continued support for a multilateral trading system. The 10 member states reaffirmed their commitment to improve ASEAN's free trade pacts and deepen engagement with the grouping's trading partners. The leaders added they have instructed ministers and officials to "exert all efforts" to resolve outstanding issues over the Regional Comprehensive Economic Partnership, to encourage the swift conclusion of negotiations over the 16-nation free trade deal. Summing up these efforts in the works at a press conference, Mr Lee said: "Over all, I'm pleased that we have completed a promising and productive first lap in Singapore's ASEAN chairmanship." ASEAN will continue to support efforts to secure the complete, verifiable and irreversible denuclearisation of the Korean peninsula in a peaceful manner, said Prime Minister Lee Hsien Loong yesterday. The regional grouping welcomes recent developments on the peninsula, PM Lee said at a press conference at Shangri-La Hotel, a day after the historic summit in which North and South Korea pledged to end their decades-long conflict. 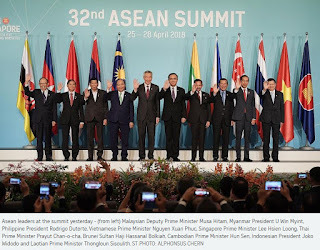 Denuclearisation of the peninsula was one of several regional developments which ASEAN leaders discussed during the 32nd ASEAN Summit hosted by Singapore. They also discussed maritime security in the South China Sea, tackling the humanitarian crisis in Myanmar's Rakhine state and global trends like free trade coming under pressure. As ASEAN chairman, Singapore is focusing on the twin themes of resilience and innovation. The leaders signed off on a statement to boost cyber security across the region, and agreed on Singapore's proposal to set up a network of 26 smart cities across ASEAN. PM Lee also announced that the model ASEAN extradition treaty was finalised at the working level last month, and work on an actual extradition treaty will start next. Summing up these efforts in the works at a press conference, PM Lee said: "Overall, I'm pleased that we have completed a promising and productive first lap in Singapore's ASEAN chairmanship." He also weighed in on Friday's inter-Korea summit. The summit supports steps to decrease tensions and improve inter-Korea relations, and will contribute to peace and stability on the peninsula and in the region, he said. "It's good that the North and South Koreans have met. It's good that President Donald Trump is about to meet President Kim Jong Un. The question is how things move forward," PM Lee added. He also said that although the first step towards denuclearisation had been taken, "the first step is the first of many and the subsequent steps will not be easy". The issue has a long history of discussions, unfulfilled deals and recriminations, resulting in a cycle of tensions and mistrust built up over a long period of time, he said. Apart from the matter of trust, denuclearisation involves many parties whose interests are not completely aligned, and the definition of denuclearisation itself and how to verify and enforce it are not clear. Said PM Lee: "There are many very difficult issues to be dealt with along the way, even assuming the best of faith on both sides. "It's a positive step, it's better than firing missiles and testing bombs, but how does it go - that's something which we will wait and see and which we can only hope for the best." ASEAN has limited leverage in this situation - it can comply with UN Security Council resolutions, make sure that sanctions are enforced and complied with, as well as speak up to add moral pressure, said PM Lee, adding: "But we have to accept that the situation will evolve in the way the major participants push the developments." Asean leaders yesterday said they were "deeply concerned" over the rising tide of protectionism and anti-globalisation sentiment, and reiterated their continued support for a multilateral trading system. 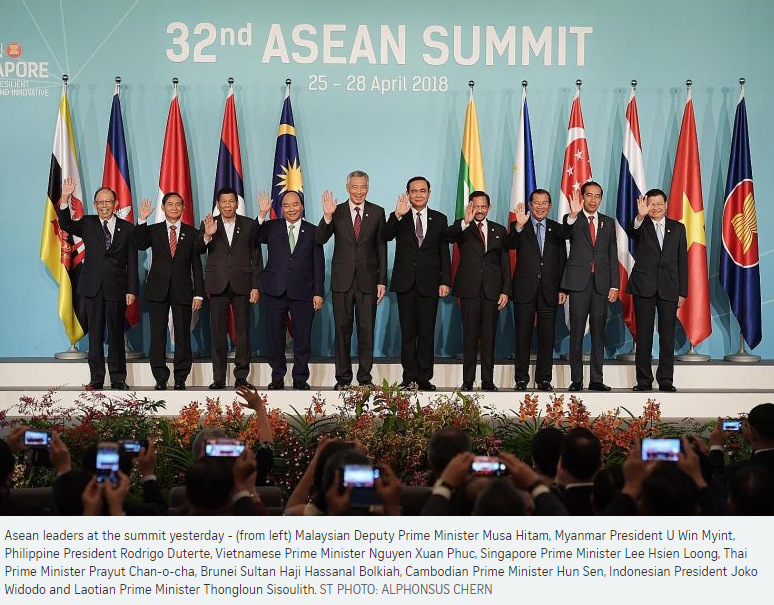 In a statement issued at the end of the 32nd Asean Summit in Singapore, the member states reaffirmed their commitment to improve Asean's free trade pacts and deepen engagement with the grouping's trading partners. The Regional Comprehensive Economic Partnership (RCEP) involves the 10 Asean members and six other countries - China, India, Japan, South Korea, Australia and New Zealand. Speaking at a press conference yesterday, Singapore Prime Minister Lee Hsien Loong said it has become more urgent to proceed with RCEP now, after the United States pulled out of the Trans-Pacific Partnership (TPP). The remaining 11 member countries - which include Singapore, Australia and Japan - are pushing on with the deal, now called the Comprehensive and Progressive Agreement for Trans-Pacific Partnership. This development has made it more urgent that the RCEP goes ahead, to signal that the countries in Asia-Pacific are pressing forward with trade liberalisation and are committed to it, PM Lee said. He noted all Asean leaders had made clear at a January summit with India that they were keen to conclude RCEP talks by the end of the year. "They've heard our message and they will consider their position." He replied that while such an outcome was not impossible, it was important for RCEP to be concluded with the current grouping - to reflect "the regional architecture of cooperation". "If you have fewer members, it would be easier to make an agreement but there was a reason we entered into (RCEP) with this shape, because we wanted to bring all the participants together and to have the trade agreement reflect the regional architecture of cooperation," he said. "I cannot say that if there's no RCEP, no smaller groupings would emerge, but as far as effort is concerned we will work very hard to have an RCEP outcome with this present grouping of 16." Singapore does not expect all regional issues to be resolved during its chairmanship of Asean, but it hopes to develop consensus on an overall approach to them, said Prime Minister Lee Hsien Loong. He was addressing leaders and delegates from the regional grouping's 10 member states at a working dinner at the Istana yesterday, as part of the 32nd Asean Summit. PM Lee said Singapore hopes to work with its Asean partners to tackle shared concerns, including growing transboundary threats such as terrorism, climate change and cyber security. "We do not expect to resolve all the issues in the span of our chairmanship, but we hope to prompt a productive discussion and develop a consensus on an overall approach, as crystallised in our vision statement, in order to take Asean forward," he said. The Prime Minister added that Singapore hopes to put forth tangible initiatives that will contribute to a more "resilient and innovative" Asean - in line with the themes of its chairmanship this year. Besides strengthening Asean's collective resilience against transboundary threats, PM Lee also spoke of the need to "make use of technology and innovation as sources of growth and development to improve our peoples' lives". Present at the dinner were Brunei Sultan Hassanal Bolkiah, Cambodian Prime Minister Hun Sen, Indonesian President Joko Widodo, Laos Prime Minister Thongloun Sisoulith, Myanmar President Win Myint, Philippine President Rodrigo Duterte, Thai Prime Minister Prayut Chan-o-cha and Vietnam Prime Minister Nguyen Xuan Phuc. Malaysia was represented by its former deputy prime minister Musa Hitam. Malaysian Prime Minister Najib Razak will not attend the summit, which coincides with Nomination Day, ahead of Malaysia's general election. The dinner was followed by a plenary session chaired by PM Lee. At the summit, the leaders will discuss the regional grouping's top priorities and challenges. They are also expected to agree on details of the preliminary phase of the Asean smart cities network. The network - Singapore's flagship initiative as Asean chair - aims to better connect digital infrastructure and services like e-payments across the region. The leaders will also discuss regional and international developments. These will likely include maritime cooperation and security in the South China Sea, the security situation on the Korean peninsula, and the humanitarian crisis in Myanmar's Rakhine state. Earlier yesterday, foreign ministers from the Asean countries discussed security issues at the Asean Political-Security Community Council meeting, chaired by Singapore's Foreign Minister Vivian Balakrishnan. At the end of a long day of meetings yesterday, ASEAN's leaders issued three statements which laid out their plans to keep the regional grouping resilient and innovative, to connect smart cities across the region to each other, and to boost cyber security. Regional Correspondent Charissa Yong reports. Asean's leaders yesterday vowed to keep their markets open and competitive and to remain united in the face of external divisive forces, in order to keep the regional grouping resilient and innovative. They issued a political statement laying out their response to geostrategic, technological challenges and opportunities faced by the region. The wide-ranging statement also reaffirmed Asean's key principles, such as making decisions by consensus and upholding a rules-based regional order. In addition, the leaders promised to "promote and protect human rights and fundamental freedoms in accordance with the Asean Human Rights Declaration". The statement was issued after a working dinner hosted by Prime Minister Lee Hsien Loong at the end of a day of meetings among Asean's 10 heads of state or government, or their representatives. A comprehensive list of programmes Asean is working on was also endorsed. This ran the gamut from countering terrorism and addressing drug and human trafficking, to improving economic integration and regional connectivity. Singapore will renew the Singapore-Asean Youth Fund to promote youth volunteerism, and set up an Asean Law Academy programme to boost Asean legal integration and education. Twenty-six cities will be included in Asean's network of smart cities, Singapore's flagship initiative as chair. Announced in a formal proposal last night, the 26 are: Bandar Seri Begawan, Bangkok, Banyuwangi, Battambang, Cebu City, Chonburi, Da Nang, Davao City, Jakarta, Hanoi, Ho Chi Minh City, Johor Baru, Kota Kinabalu, Kuala Lumpur, Kuching, Luang Prabang, Makassar, Mandalay, Manila, Naypyitaw, Phnom Penh, Phuket, Siem Reap, Singapore, Vientiane and Yangon. The network aims to use technology to tackle challenges caused by rapid urban development, such as city congestion, water and air quality, and public safety. It will be officially launched in November this year. Individual cities will come up with their own development plans, which will outline specific projects to be carried out from this year until 2025. They will meet annually to discuss their progress, launch new projects with companies, and secure funding and support from multilateral financial institutions including the World Bank, Japan-led Asian Development Bank, China's Asian Infrastructure Investment Bank, and the G-20's Global Infrastructure Hub. The network aims to bring together the various smart cities popping up across Asean. As these cities often have different priorities, the network will allow them to focus on areas that matter to them, said the statement. Asean's leaders have agreed to better coordinate their countries' cyber-security policies and cooperate more closely. In a statement released late last night, they pledged to come up with a concrete list of practical norms of state behaviour in cyberspace, which Asean can work towards putting in practice. These norms would be voluntary and non-binding. The statement also said leaders would cooperate to tackle vulnerabilities in the region's critical infrastructure, and encourage measures to address the criminal or terrorist use of cyberspace. Doing so is important given the pervasiveness of cyber threats around the world, and the spread across Asean of mobile devices connected to the Internet. It said the relevant ministers have been tasked to submit recommendations on feasible ways to coordinate cyber-security policy, among other things. The statement also acknowledged the benefits of the region having a peaceful and secure cyberspace. For instance, many jobs can be created, and economic and technological progress can also be boosted, it said.